As companies adopt more and more SaaS applications, there is a pressing need to connect these applications to each other, as well as to legacy applications. Companies who don’t create connectivity between SaaS applications end up with information silos. Front office applications, without information from the system of record, don’t provide value. Back office data, if not surfaced in a system of engagement, is irrelevant. What if you could connect all your SaaS and on-premises applications with a single platform? You could achieve a single view of your customer, across every application that touches the customer lifecycle. You could streamline your quote to cash office, removing error-prone, manual processes and accelerating the revenue cycle. You could unlock your back office by bringing relevant records and information into systems like Salesforce to bring value to your sales teams. 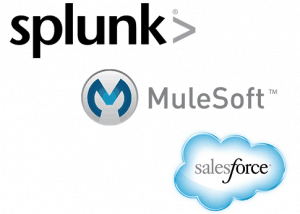 In our latest webinar, “How Splunk Connects Salesforce”, Christopher Nelson, Senior Director of IT Business Applications will show you how Splunk is working with MuleSoft to connect applications across their architecture. Chris Purpura, GM of CloudHub Cloud Platform, MuleSoft will discuss how the Anypoint Platform helps connect SaaS applications like Salesforce. Register below or learn more. Awesome blog its very informative thanks for sharing.